At Eagle Transmission Shop Wylie our motto is “The One To Trust.” That’s not just some commercial slogan we came up with. It is in-fact a principle whereby we, at Eagle Transmission, our business. We know that you have a choice, and we strive every day on each repair to provide top notch professional service. 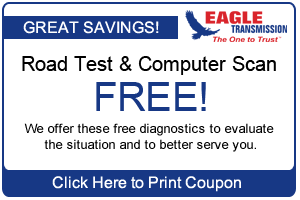 We offer free road test and computer diagnostics. We work on Standards & Clutches, Automatics, Front-wheel, 4 Wheel, RV’s, CV Axles, Domestic, Imports, Light and Medium Duty Diesel Trucks and Diesel Auto Transmissions. My truck has never run so well. Jason and the entire team exceeded all my expectations. Not only was. I impressed by the work, but the professionalism was outstanding, as was the hospitality. Thank you all. I will certainly repeat business here if I need them again. I cannot recommend them enough. Good service. Manager Jason was very helpful. Will visit again for auto needs. I worked with James there at Eagle Transmission and he and his guys did a great job on my complete transmission replacement. 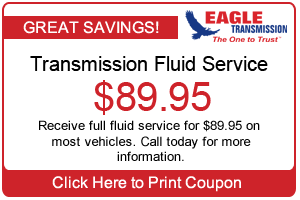 I had already taken my car to other shops so i knew it needed to be replaced but i had worked with Eagle Transmission before so i chose to have them do the work and i was not disappointed. The car is now running great and i feel like i got the best possible deal with these guys, i will absolutely take my other cars there from now on.